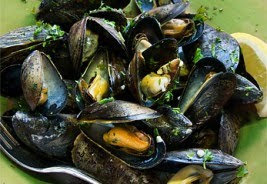 In honor of St. Patrick’s Day, spike your mussels with Guinness, garlic, and a wee sprig of parsley. Strict vegetarians, who would be unlikely to enjoy mussels, can’t drink Guinness as isinglass finings, made from the dried swim bladders of fish, are used in the ale’s clarification process. (This fact is brought to you by Robipedia -- my collection of what Clare on Modern Family would call “random and not helpful facts.”) Bain taitneamh as do bhéil! Heat a stockpot over medium heat. When the pot is hot, add the mussels and remaining ingredients and cover immediately. Cook, stirring once or twice, for 6 to 8 minutes or until the mussels open. Discard any that don’t open. To serve, divide mussels among shallow bowls and ladle the broth over them. Sprinkle with parsley and serve with a wedge of lemon and slices of bread to sop up the juice. Serves 4. This recipe is edited and adapted from one that was once featured on the menu of the Brazen Head, a traditional pub in Dublin and one of the oldest pubs in Ireland. It also appears in The irish Pub Cookbook by Margaret Johnson. 101 best online casino games with amazing bonuses for UK players this winter. Play and win.